WIKIPOPULI - In Collab ðÂ My Whatâs Handbag? In Collab ðÂ My Whatâs Handbag? Lip Balm: Need I say more? My (Magnificent) Maybelline Lip Balm is literally a life-saver for my lips! Purse: Everyone needs a wallet/purse to place their money in! I bought this Guess Wallet, last November during the Stunning Black Friday Sales, and I absolutely LOVE it! Itâs just SO cute! Chocolate Bar: Because…Why Not? Having a snack with you (especially if itâs a yummy chocolate bar) is one of the BEST feelings ever! You canât guarantee when youâll get hungry, right? Perfume Stick: Iâm one of those people who get really happy if someone compliments them with the fact that they smell good – This is why I always have this Zara Perfume Stick in my handbag! It smells really lovely, and it instantly puts me in a good mood! Water Bottle: Quite a necessity, donât you think? If I have a large handbag that fits, things are great! But…if Iâm carrying a small handbag – then I usually just hold my bottle in my hand! House Keys: Iâm sure we ALL have this item in our bags! I place my house keys in this pretty black pouch which is attached to a black furball keyring! TrÃ©s Chic, Oui? Optional Extras: These include anything else that isnât always in my handbag, but sometimes can be! For Instance: Sunglasses Case, Hand Cream, Notebook Etc. Tell Me…What do YOU carry in your handbag? Did you like this post? Any thoughts? Any comments? Say It All In The Comments Below! Make Sure To Check Out BlushyDarlingâs Post To Find Out What She Carries In Her Handbag & What Makes Her Unique! Hiiii There Everyone & Welcome To The 1st Post Of November! Iâm (finally) back from my little vacation, and Iâm a little guilty âcause I havenât glanced into my WP Reader for 10 whole days! *oops* But,hey, donât say I didnât warn you! If youâve read my last post, youâd probably recall the fact that I traveled to somewhere special in the middle east (I promise Iâll tell you where soon!) and that I had been MIA for a short while! If you didnât read my post…#1 How dare you?! #2 I’ve just updated you with what you missed anddd #3 Make Sure To Go Read It! Anyway, Iâm back now, and let me tell you: itâs so difficult leaving all the fun and all the excitement, and coming back to schoolwork & the reality which tends to be a little too harsh for my liking. Hope you all have a happy, relaxed and productive November! Iâve got plenty of posts planned for this month – especia a couple which have to do with my amazing traveling adventures! So, Donât Forget To Regularly Check My Blog Posts! 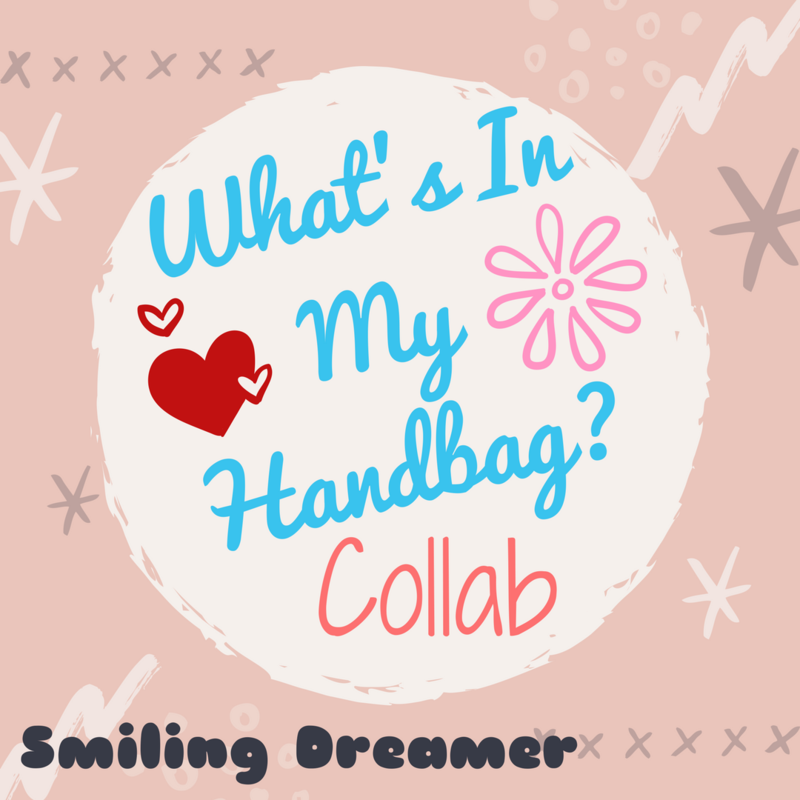 Well…Today, I present to you another fabulous collab with BlushyDarling and itâs all about (you guessed it…) what I carry around in my handbag! Thereâs so much you can tell about someoneâs personality from knowing what they like to have in their handbag, so here we are! While the post idea isnât really that original – each post by each blogger is completely unique & different! Thatâs what makes it awesome! Make sure to check out BlushyDarlingâs Blog, because sheâs an AMAZING Beauty Blogger! I Love Her Blog, And Iâm Sure You Will Too! Sheâs So Sweet And Kind, Plus Her Posts Are Always Enjoyable! Phone: Duhh – that is like one of the really important things I carry in my handbag! We all need some form of communication with the world! I donât think I can leave my house w/o my phone – I donât think anyone can! Makeup: I usually have a mini makeup bag with me & I place in it either lipstick or a lip pencil along with blusher, and sometimes mascara! Hand Sanitizer: Bath & Body Works have the best sanitizers – They just smell so good & refreshing! I like to have sanitizer in my bag to make sure my hands are clean & fresh! Blue Pen: Having a pen in my bag has proven to be useful! You never know when you might need to write down something, or lend someone a pen! Hair Ties: 99% of the time, I wear (is “wear” the right word?) my hair down, but it always helps to have some spare hair ties in my bag! Hair Brush: Does this need an explanation? Headphones: YASSSS! The main reason is OBviosuly for listening to music – but I also use them for making phone calls, since itâs better to ise your headphones rather than placing the phone on your ear!